Please complete multiple registrations for multiple pets! 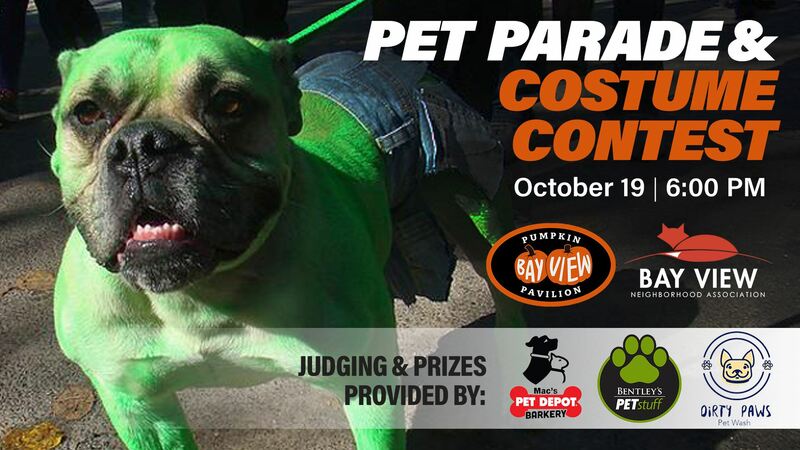 Bay View Neighborhood Association Pumpkin Pavilion Pet Costume Contest will take place at Humboldt Park on Friday, October 19, 2018. Please arrive between 5:00 and 5:30pm to confirm your registration and to be given a participant number for your pet. Judging will begin at 6:00pm. The contest will have five judges. There will be a first, second and third place winner. All pets will be presented in one general costume category. Use your imagination! Homemade, hand-me-down, magically found and store-bought costumes are welcome. Prizes will be awarded on site. Entrants must fill out a registration form with the name of the pet, the owner’s name, owner’s zip code, a description of your pet (dog, cat, rabbit, etc.) and provide a donation of $5 (per pet) to the Bay View Neighborhood Association. Entrants will be given a participant number upon arrival to the Pumpkin Pavilion grounds which must be worn so that it is visible to the judges. Pets must be leashed at all times and have his/her own adult owner present. The judges’ decisions are final and are based upon points gained for: Originality, Costume Details and Use of Accessories. No entrant is eligible for more than one award. Bay View Neighborhood Association is not responsible for any lost or stolen items associated with your pet’s costume or prizes. By including your pet in the BVNA Pumpkin Pavilion costume contest you are giving permission for their photo to be used for BVNA purposes. Your pet may be featured in our photos of Pumpkin Pavilion in various platforms. Please check our social media and websites for photos.